Born in Lebanon, in 1942, Chaouki Chamoun received his Diploma of Higher Studies from the Fine Art Institute at the Lebanese University in 1972. The first in his class, he was awarded a six-year fellowship to pursue his graduate studies in the United States and rejoin its faculty upon his return. In 1975, he received his Master of Fine Arts from Syracuse University, N Y. And from 1975 to 1979 he was a full time fellow at the PhD program at New York University, NY concentrating on Aesthetics and Studio Art. Chamoun has had over thirty One-Man Shows since 1975; exhibiting in New York,Beirut and other cities in the United States, Europe, Hong Kong and the Arab World; represented mainly by Epreuve d’Artiste Gallery in Beirut. He also has participated in over fifty five group Art Shows and biennales since 1968 including Rochester Memorial museum 1974, Lowe Art Centre, Syracuse 1975, Soursouk Museum, Beirut, 1984-2008, Europ’Art, Geneva 1999, Sotheby’s Exhibit and Auction London Oct.2007, Christie’s Exhibit and Auction Dubai October 2007 and April 2008, Art-Paris at Abu Dhabi 2007-2008, Alexandria Biennale 2008, The Katzen Art Museum Washington DC 2010 and Abu Dhabi Art fair, MENASA art fair Beirut 2010-2012. His work is internationally acquired, and heavily reviewed in newspapers, magazines radios and televisions. He is also featured in several art books and his book “The Art and Life of Chaouki Chamoun” was launched by SAQI in London, 2013. As an influential educator Chamoun taught art at several universities since 1975 in Lebanon and the USA;and as an acclaimed interior architecture designer with major New York design firms, his high-end projects include Saks Fifth Avenue, Bloomingdale, Jordan March and Dressbarn in New York, Washington, Chicago, San Fransisco and other US major cities since 1989. 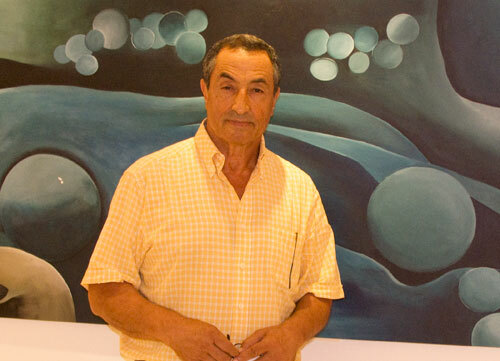 Chaouki Chamoun registered a distinguished record sale for a living Lebanese artist at Christie’s 2007 auction, and Art Price ranked him in the top 50 newly auctioned Artists world wide. And In its 2011 ballot, The Arabian Business Magazine named him one of the power 500 most influential professionals Arab in the World. Notably, his works have been generously acquired in several charity auctions since 2008 benefiting children in educational, health and social institutions in Beirut and other Arab cities.